It prompted a U.S. Air Force UFO inquiry, part of an initiative called Project Blue Book. 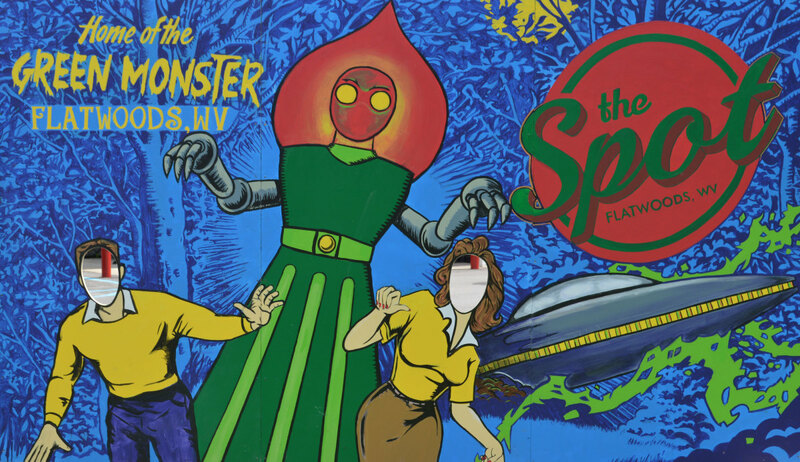 The Flatwoods Monster has not hissed at boys in the little village of Flatwoods, West Virginia, since Sept. 12, 1952. People grin about it now—and take Monster souvenir money, from hundreds of Monster tourists every week. 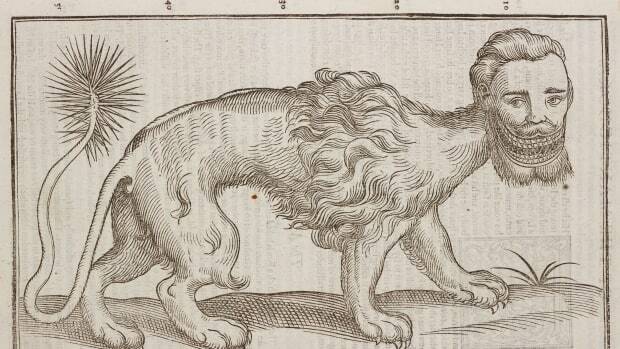 But it scared people plenty back then, including the eyewitnesses: six boys aged 10 to 17, a dog and a Mom. The encounter made the local and national news, scaring a wider swath of people. 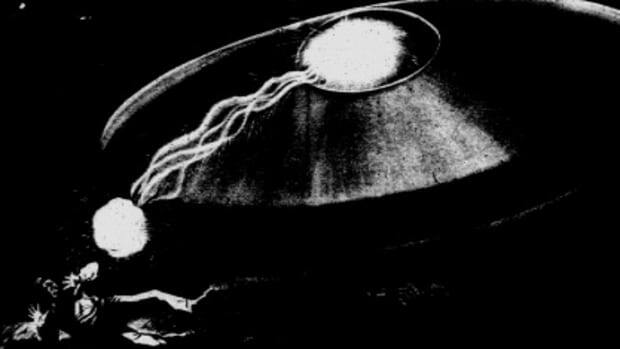 Then it prompted a U.S. Air Force UFO inquiry, part of a project called Project Blue Book that dispatched a handful of investigators around the country to look into such claims. 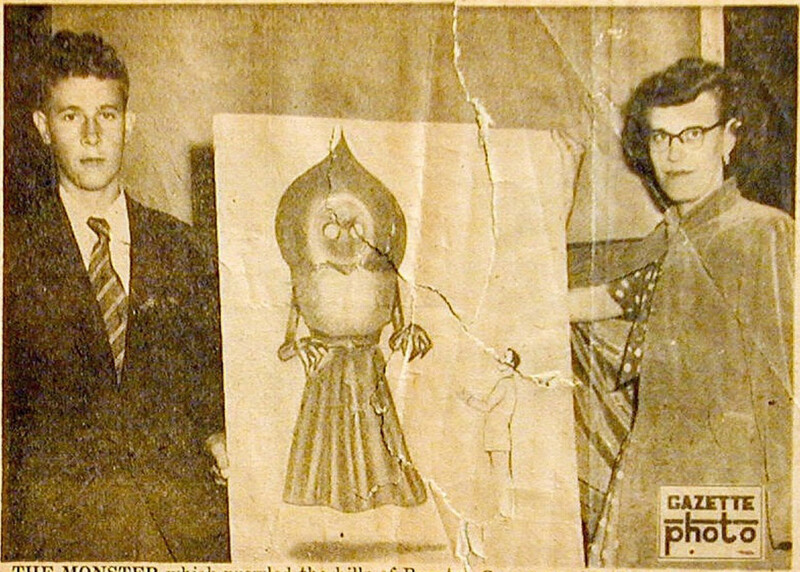 Flatwoods residents Gene Lemon and Kathleen May, who claimed to have seen the monster and provided descriptions for the famous sketch. It also became a local legend, a Southern spook story that defined the tiny village of less than 300 people for more than six decades. 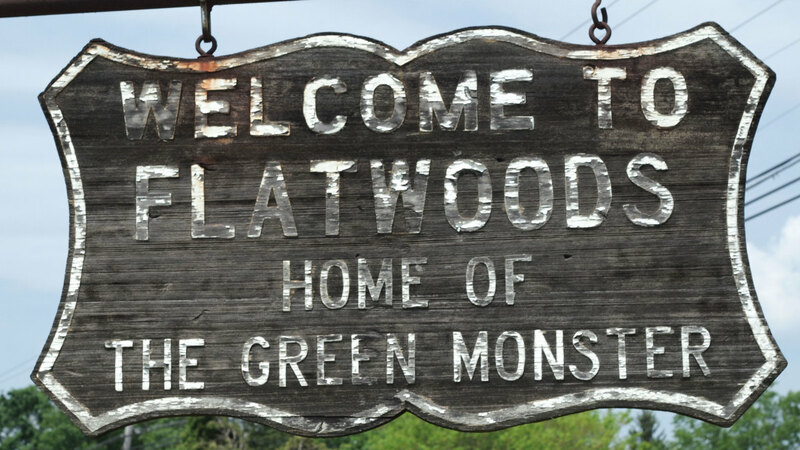 To this day, tourists come out of their way to Flatwoods—secluded in the low, timbered Appalachian hills of central West Virginia—to visit its monster museum and buy Green Monster tchotchkes and T-shirts. It was dusk when they saw it. The May brothers Ed, 13, and Freddie, 12, had been playing in their schoolyard with their 10-year-old friend Tommy Hyer. After noticing a pulsing red light streak across the sky and crash on a nearby farm, the three youngsters ran to grab the Mays boys’ mother, then high-tailed it up that hill to check out where the light had landed. A few other boys, one with a dog, showed up too. 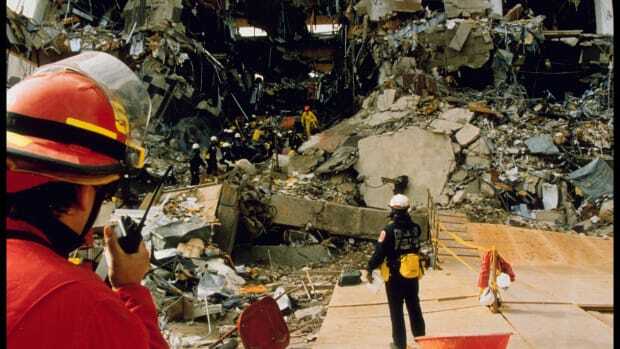 They ran back down—in sheer and credible terror. Lemon screamed and fell backward, the news account said, “when he saw a 10-foot monster with a blood-red body and a green face that seemed to glow.” It may have had claws for hands. It was hard to tell because of the dense mist. The story made the local news, then got picked up by national radio and big papers all over the country, said Andrew Smith, who runs the Flatwoods Monster Museum and the Braxton County Convention Visitors Bureau. “Mrs. May and the National Guard kid ended up going to New York to talk to CBS,” Gibson said. 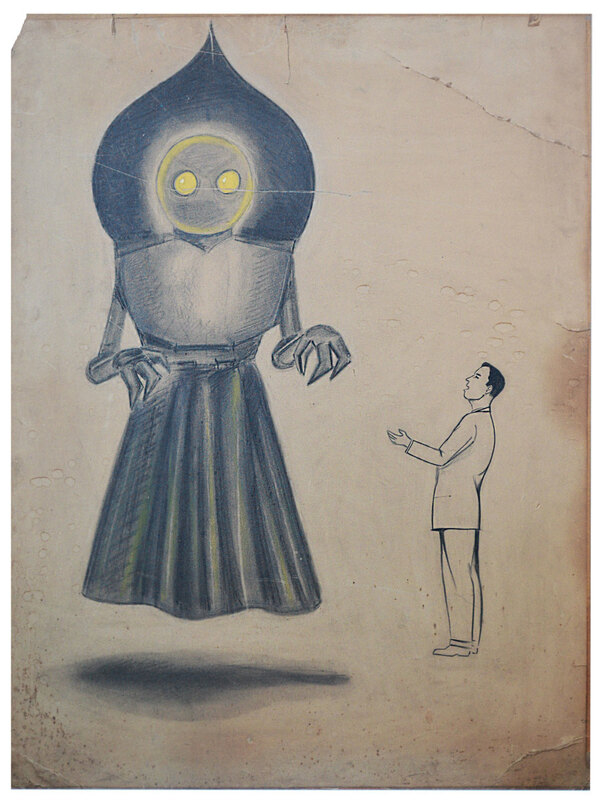 The original drawing of the Flatwoods Monster by a New York sketch artist. 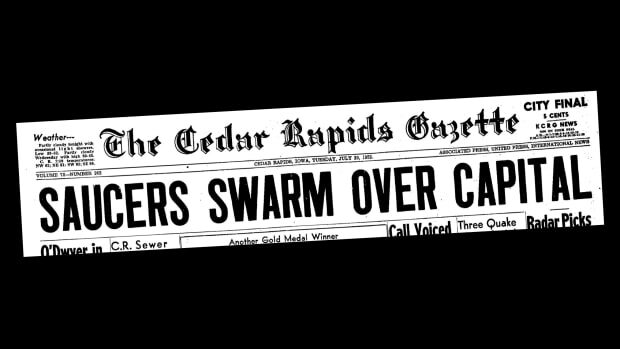 “Those people were the most scared people I’ve ever seen,” said local newspaper publisher A. Lee Stewart, in that 1952 news story. Stewart himself had marched up that hill with a shotgun after witnesses told what they saw. “People don’t make up that kind of story that quickly,” Stewart said then. Gibson doubted too, though he’s since sold 1,000 of his 12-inch-tall ceramic Green Monster figurines in just the last two years (at $30 apiece). But rattled eyewitnesses weren’t the only reason the story took off. Americans were truly frightened in 1952, made anxious by atomic bombs and what seemed like a new world made by mad scientists. Even LIFE magazine, probably the most popular publication in the nation at the time, had, just a few months earlier, published a seemingly credible trend story about flying saucers. Spook stories sprout best when the seed lands in a bed fertile with anxiety, and that was 1952 Cold War America—a hothouse of anger, disillusionment and anxieties, made to order for conspiracy theorists, political demagogues and tellers of suspenseful tales. The May brothers’ monster story hit just three years after the Soviet Union successfully tested an atomic bomb in 1949. The Air Force was scanning for bombers over our skies. Julius and Ethel Rosenberg were awaiting execution for sending American nuclear-weapons designs to the Soviets—selling hellfire to our mortal enemies. A political demagogue, Sen. Joseph McCarthy of Wisconsin, had spent the previous two years stoking fears that communists had infiltrated not only the U.S. Department of State, but almost every industry and corner of the nation. And communists had killed thousands of American soldiers in Korea by 1952, including four youngsters 21 or younger from Braxton County, West Virginia, who died just months before the Monster landed. One of those killed in action, U.S. Marine PFC Lantry R. Frame, age 20, had grown up in Sutton, only six miles from the May boys in Flatwoods. “HAVE WE VISITORS FROM SPACE?" The story, filled with seemingly “credible” accounts, including from eyewitness Air Force pilots, appeared in April 1952—just five months before Ed and Freddie May climbed that hilltop. A piece of wood that was taken from the once-standing tree where the Flatwoods sighting occured on September 12, 1952. 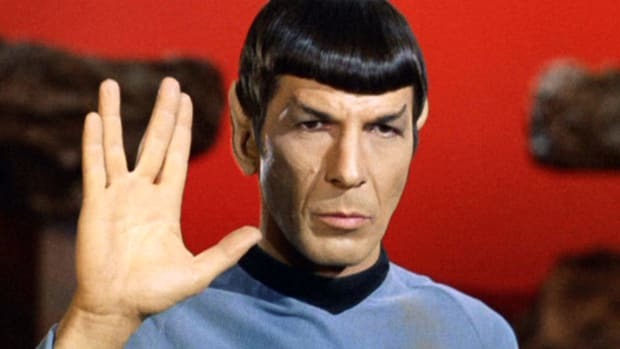 Call it “cosmic loneliness,” Routledge says. That may be. But if the May brothers are familiar with that phrase, they are probably rolling their eyes. Freddie and Ed are still alive—and still standing by their story. They are in their late 70s now. They are no longer talking to reporters. “They got tired after 100,000 interviews,” Smith says. One writer who stoked the story (a lot) was Gray Barker, a Braxton County native who investigated the Monster—and then became one of the more prominent UFO myth makers ever. 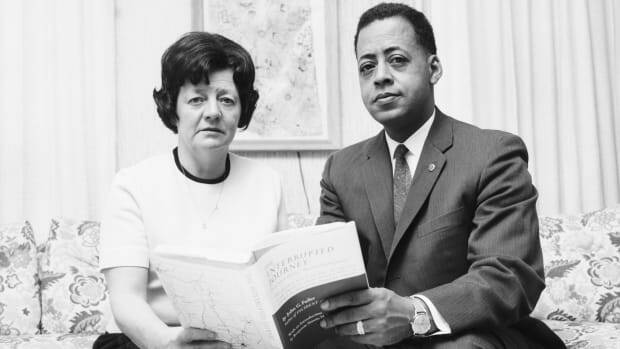 It was Barker who wrote about Flatwoods, then introduced the mythology of government “Men in Black,” after he heard that two Air Force investigators had “reportedly” shown up in Flatwoods, posing as magazine writers. But Barker’s friends later said he didn’t believe—and did the UFO writings cheerfully and for money. To this day, locals still wonder. There were fewer than 300 people Flatwoods in 1952, and a few less than that now. “You could say that local embrace of the Monster was a little slow going,” Smith says. Could it have been an owl? The U.S. Air Force doubted too. They later revealed that they’d done UFO research and investigations since 1947, collecting thousands of stories, investigating some with a skeleton staff. About this one, they concluded that bright but common meteors had streaked across the eastern U.S. at dusk that night, seen by many in Baltimore, among other places. And the monster with the claw-like arms? Likely an owl, they said. And they learned, to their surprise, that people wanted to hand them money. From spring to fall, peak tourist season, hundreds of people a week stop in the Spot, Flatwoods’ ice cream and sandwich eatery. They eat the Flatwoods Monster Burger (double burger, double cheese), and look at all the historic Monster photos and news clippings hanging on the wall. 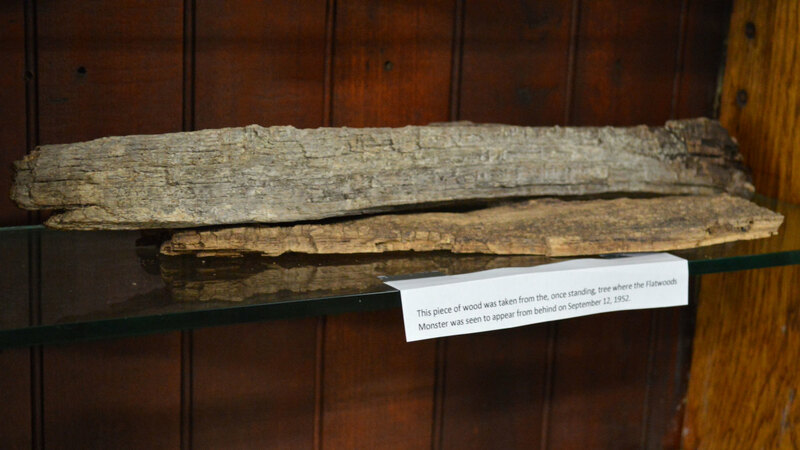 The Museum has artifacts, including a chunk of the oak tree that the Monster had floated out from behind. And so the Flatwoods Monster, also known as the Green Monster, also known as the Phantom of Flatwoods, who was reportedly seven feet tall, or 10 feet tall, or 13 feet tall, or 17 feet tall, became that most peculiar American invention—a legend emblazoned on T-shirts. “If you know how I could get a 26-foot fiberglass Green Monster statue made for Flatwoods, let me know,” Gibson said.